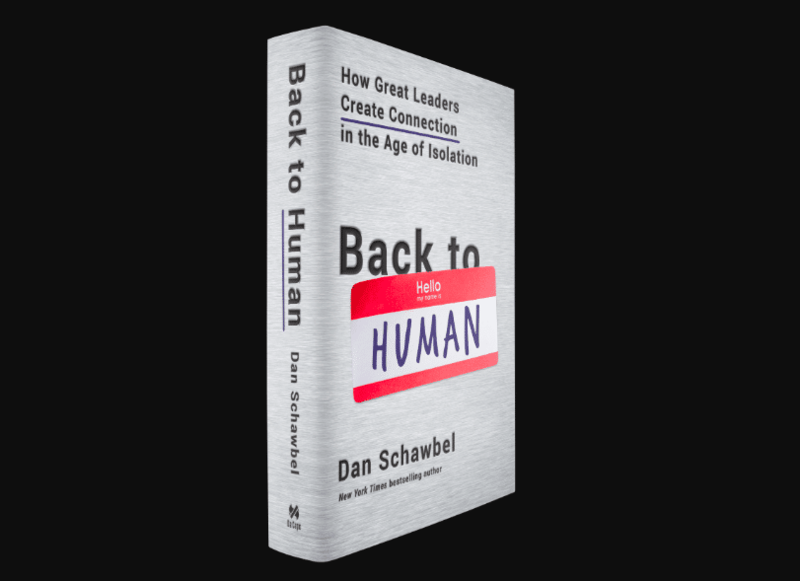 Recently, I had the good fortune of sitting down with Dan Schawbel to talk about his new book, Back To Human: How Great Leaders Create Connection in the Age of Isolation. As somebody that is totally burnt out on all things digital (so much so that I’ve just gone back to school for a Masters in Psychology), the message in Dan’s book, particularly resonated with me and I wanted to know, how can we all keep going like this, living in a 140-character world? Well, the truth is we can’t, but Dan tells us what we can do, in a very fascinating read. To learn more, click here to get a free introduction download, but first check out our convo below! Technology has created the illusion that we are highly connected, when in realize it’s isolated us from others. Instead of strong bonds, we have weak ties. For me personally, when I overuse and misuse technology it cuts me off from the very relationships that matter in my life. Early in my career, many of my relationships were made online but it wasn’t until I made the conscious effort in meeting people in person did my network strengthen. Through meeting people for coffee, a meal or at an event, I had more meaningful relationships. These meetings were facilitated by technology, but in-person I was fully present without continuing to use that same technology. The main message in the book is to use technology as a bridge to human interaction not a barrier. 2. How important to good leadership is ‘connection’? Work is about the work you do and who you do the work with. As a leader, your work becomes the people you are with! You are trying to inspire and support others with your vision. Leaders need to instill trust, create a sense of belonging and purpose, while promoting happiness. These are the four employee engagement factors discussed in Back to Human, and combined they create a health, productive and exciting corporate culture everyone can be proud of. Leaders need to be empathetic with their teammates and embrace them as people, not just as workers. People want to bring their full self to work so it’s a leaders responsibility to accept them as who they are, free themselves from judgement and be supportive of their individual needs. 3. You, like me, agree that technology can be a great thing – when used the right way. What does the ‘right way’ look like for you? I interviewed 100 top young leaders from the best companies in the world for the book, including Facebook, Johnson & Johnson, Starbucks, EY, GE and IBM. Most viewed technology as being a double-edge sword – it can be good or bad depending on how, when and where you use it. For instance, sending a text to remind a teammate about a meeting is perfectly accepted but trying to resolve an argument by texting isn’t effective. The right way to use technology is case-by-case. In the study we did with Virgin Pulse for the book of over 2,000 managers and employees in 10 countries, we found that email is the biggest thing that gets in the way of face-to-face conversations, yet a study in the Harvard Business Review found that one face-to-face conversation is more successful than 34 emails back-and-forth. 4. You talk a lot about a responsibility to take care of yourself, if you’re to be a truly great leader. (I love this!) How do you take care of yourself? Chapter 1 of the book is entitled “focus on fulfillment” and then I talk about how you need to be fulfilled first before you focus on your team. This might seem counterintuitive but it’s so true. If you are fulfilled, then it’s much easier to get other people aligned with your vision and for you to rub off on them in a positive way. When you’re happy and positive, other people gravitate towards you and it’s easier to have conversations with them about their fulfillment as a result. Everyone has a different dream, goals and life situations. Once you take care of yourself, you become an inspiration towards them and can help them reach their own dreams using work as a vehicle. 5. Gratitude and Fulfillment are two terms I use a lot on the blog (and in my life) You have mentioned them both here in your book. How are these important to the future of the workplace? We spend a third of our lives work so we need to derive at least some of our fulfillment from the work we do and who we do it with. There are ups and downs in business, and in life, so we must have gratitude for what we’ve accomplished because there will be failures along the way. There’s a close connection between work and life. If you don’t get along with your co-workers, you take that negativity into your household. If you get into an argument with your spouse, you take that negativity into the workplace. This is why it’s CRITICAL that leaders are empathetic because we don’t know what everyone is going through at that given time. 6. What is your top advice to get ‘back to human’? My best advice is small steps before big leaps. For instance, during your next meeting, make everyone put their cell phones in the middle of the table as an experiment. Based on my experience, and research, I think you will find that the meetings are more functional, productive and shorter. Technology can be a major distraction during meetings and the average person sends five texts during them. Be present in your next meeting so that you can create stronger relationships with your team and actually take note of what’s going on in your company. Dan Schawbel is a New York Times bestselling author, Partner and Research Director at Future Workplace, and the Founder of both Millennial Branding and WorkplaceTrends.com. He is the bestselling author of two career books: Promote Yourself and Me 2.0. His third book, Back to Human: How Great Leaders Create Connection in the Age of Isolation, is out now! Through his companies, he’s conducted dozens of research studies and worked with major brands including American Express, GE, Microsoft, Virgin, IBM, Coca Cola and Oracle. Dan has interviewed over 2,000 of the world’s most successful people, including Warren Buffett, Anthony Bourdain, Jessica Alba, will.i.am, Michael Bloomberg, Chelsea Handler, Colin Powell, Sheryl Sandberg, and Arnold Schwarzenegger. To read more from Dan’s new book, Back To Human, click here! one of the best article, must read.